This new pattern (and the recipe I've included for my favorite sweet lemony treat) will make your mouth water! It finishes up at 43" x 52". A few months ago I got on a lemony, yellow and green, fresh squeezed "kick" and a few weeks later, Fresh Squeezed was born. She's scrappy and sweet and perfect for summer! Borders, backing and binding are by Sunkissed by Sweetwater for Moda. If you're coming to Market, I hope you'll come by and see us. Booth #1142. Very pretty! I like the quilting you did and the use of ric rac at the bound edge. very cute! and I too love the ric rac at the binding! Oh sweetness! DARLING! I am thinking of doing it up in some figgy fabric. You know all of fig trees creamy yellows and greens. I am in a very subdued color mood lately. I hope I can snag a pattern from you before they are all gone! Save me one!!!! It's perfect!! Makes me want a glass of lemonade. This would look beautiful with some pinks for some pink lemonade! Great Pattern! OH MYLANTA!!! That is thee CUTEST quilt I have seen in a LONG time. I love the colors, the ric rac, the quilting, EVERYTHING! WOW!! It's beautiful. You're sure to be a hit at the show!! Great look and I love the Sunkissed that you used for it. Gorgeous. Love it, love it, love it. Oh I love the lemons! I love love them. See you soon. What a great design! I can see it done in oranges too for Fall. Great job! Love the ric rac trim! What can I say but "Another Winner." Have fun at market. Finally! A cute yellow quilt! That is darling! I love this quilt. It's really fun and I love the quilting. Oh, I may just have to have this one. I love lemons and decorated my last kitchen in lemon stuff. Such a fresh look for summer, Amber. I can't wait to see pictures of your booth. You have worked so hard. It will be the best one there. So fresh, yet soft and squeezable! This quilt is absolutely breathtaking. ;-) All of them are! I'm back for a second look! Just too cute. Gonna go see what yellows are in my stash & get a stack of fabric going for it. I absolutely love this -- how do I get the pattern??? Please show us your booth photos from quilt market! 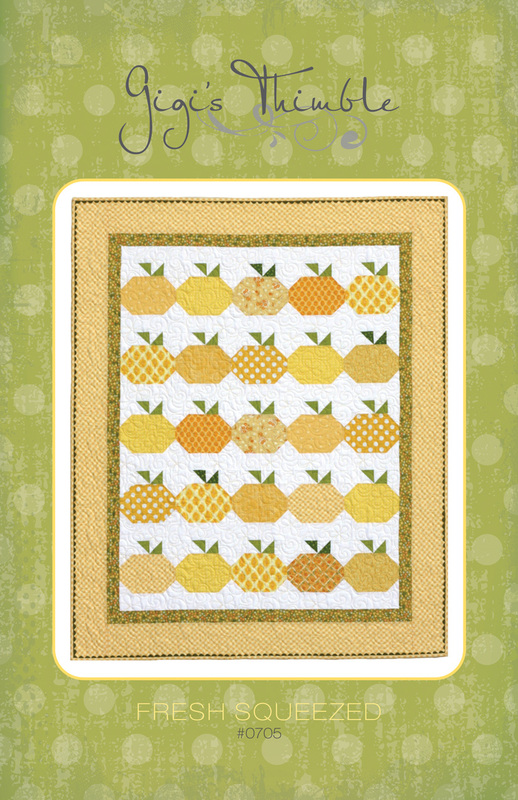 This quilt is just adorable! The guilting on this is just so awesome!